The Circle Puzzle is a simple puzzle consisting of four overlapping circular disks in a square arrangement. Each disk overlaps with the two adjacent disks but not with its diagonally opposite disk. Where two disks overlap they form a lozenge shaped piece, and each disk has four such pieces around its rim. All together there are 12 moving pieces. Each disk can be rotated. A rotation should be a multiple of 90 degrees since only then can the other disks move again. 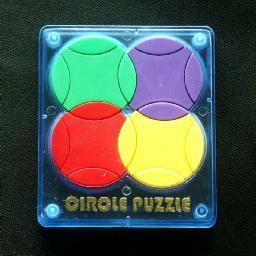 The puzzle has a simple colour scheme where each disk has a single colour - yellow, red, blue, and green. The four shared pieces also have one colour each, so that when solved each circle has three pieces matching its centre colour and one shared piece matching the adjacent disk. The puzzle has two solved positions which differ by the colours of the shared pieces. The puzzle is related to Turnstile, Rashkey, and also to Gripple, but is much simpler than any of those. The second puzzle pictured above is the Whirligig. 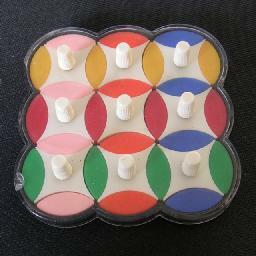 It is a 3 by 3 version of the Circle Puzzle, with a 6 colours and four pieces of each colour. The circle centres are not coloured. Solving it is just as easy, but there are more nice patterns possible. There are 12 pieces, giving a maximum of 12! arrangements. The limit is not reached because there are four sets of three indistinguishable pieces. This leaves only 12!/3!4 = 369,600 positions. I have done a computer analysis of the Circle Puzzle in order to find God's Algorithm. The results are in the tables below. Analogous to the Rubik's cube, there are two ways to count the moves. The Face Turn Metric means that a turn of any disk by any amount is a single move. The "Quarter" Turn Metric means that only 90 degree turns are single moves. If you want to only use one of the two solved positions, then it can be solved in at most 12 face turns or 12 quarter turns (on average 7.5600 and 8.9442 respectively). If either solved position is acceptable then it may take 11 face turns or 12 quarter turns (7.3238 and 8.6523 on average). The hardest positions in the face turn metric are shown below. Every edge piece is moved to the diametrically opposite spot compared to the solved position. Phase 1: Solve the bottom left disk. This is trivial, so I will not elaborate. Once all three pieces of the matching colour are in the bottom left disk then turn it so that they are on the left, top and bottom, i.e. the non-matching piece is on the right. Phase 2: Solve the top left disk. Find a piece of the same colour as the top left disk, but which does not yet lie in that disk. If that piece lies in the bottom right disk, then turn that disk to bring the piece to the top, so that it is in the top right disk. Turn the top left disk so that one of its unsolved edges is on the right. Turn the top right disk so that the piece you are solving lies on the left. This puts it in the top left disk, which is where it belongs. Turn the top left disk back to its original position, so that the bottom left disk is correct again. Repeat steps a-e until the top left disk is solved. Phase 3: Solve the remaining two disks. Rotate the puzzle as a whole anti-clockwise, so that the two as yet unsolved disks are the top left and top right. Use the method of phase 2 to solve the top left disk. The top right disk will automatically be solved as well.